There was a time when I used to say that if it stood still long enough I will stamp it. That statement eventually made way to this one: if it stands still long enough I will paint it with Lumiere paint but now I can add to that "if it stands still long enough I will Zentangle it!" Oh my..... I'm hooked! How can something so simple have such an addictive effect on you? I just can't explain, except to say that I'm now seeing patterns absolutely everywhere I look. I never noticed them before but now I see they are everywhere around me. And I just feel compelled to get them onto paper before I forget them. I have doodled so much over the last few weeks that I have run out of ink in my trusty Zig writer so it will be a trip to Officeworks this week to see what other suitable pens I can find to doodle with. So without a pen to doodle with I think I should share a couple of the things I've been up to. 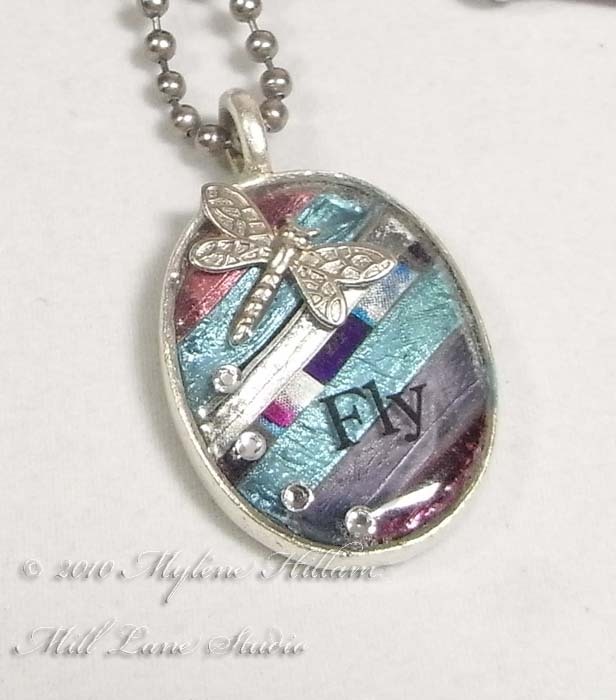 Firstly, a pendant. This is a slight variation of the one I featured last week. Looks funky on the 1970's inspired background, doesn't it? For this piece I've wrapped my Zentangle disk in a silver filigree stamping so it has a lovely patterned back as well as the doodled front. Those fun little silver puffs are actually balls of bright, shiny wire. They add a really fun touch to the choker. Of course, as I said earlier, you can Zentangle any surface that stands still long enough which leads me to the next piece which is worked on a more traditional surface, cardstock. 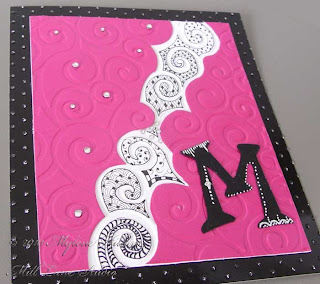 This piece is part of an upcoming class where you will learn how to incorporate some simple Zentangle patterns into your papercrafting projects. More details will be available closer to the class date but I do hope you'll pencil this class into your diary. And whilst I'm talking about classes, here's what I'll be teaching this Saturday at Stamp Antics. 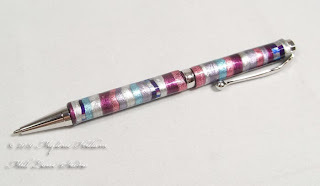 Join me in the morning for a class using the latest and greatest product to hit the shelves in your local papercrafting shop: Kutalicious mirrored acrylic embellishments. These are manufactured right here in Brisbane and I'm proud to be supporting such a great product made by a local manufacturer. 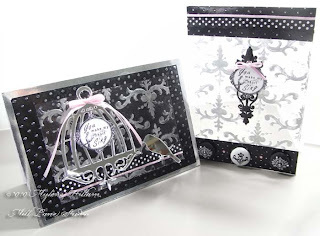 In class we'll be using the birds and birdcages which are all the rage at the moment but there are many other shapes and themes available in the range. You'll also learn another technique for colouring acetate. You can check out the class details on my website. In the afternoon class we'll be working with Friendly Plastic. If you've ever wanted to make the wonderful mosaic pens you see sprinkled throughout the pages of my blog, then this is the class for you. 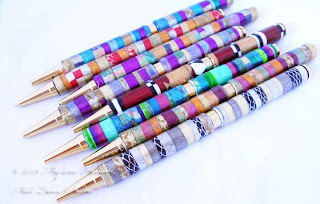 You'll learn the basics of working with Friendly Plastic and all my secrets for successfully making your own Friendly Plastic pens. Don't worry if you've never worked with Friendly Plastic before.... I will walk you through every step of the way. Check out the details of the class at Mill Lane Studio. Have you ever run your hands through a big box of buttons? It's a really lovely feeling having all those smooth buttons running over your fingers. For me it brings back memories of my childhood. You see, my Mum was a great sewer and she had an extensive collection of buttons that she kept in old biscuit tins. Most of them were rescued from garments which had seen better days and many of them still had the thread attached to the back of them. Sometimes there was even a little tuft of fabric attached as well which identified the garment it was from. It was a pleasant way to spend a half hour rummaging through the tins, sorting the buttons into their colours, shapes and sizes. Ah.... the simple things in life! Recently I had the chance to play with a large stash of buttons courtesy of the fine folks at Blumenthal Lansing. No stray bits of thread or fabric attached to these buttons but as I emptied them out onto my bead mat, I couldn't resist scooping them up and letting those smooth buttons cascade over my finger tips and back on to my workspace.... what a joy! And just as I had done as a child, I sorted and categorised them but this time I was doing it to see what worked together. They were all shapes and sizes: some were metal, some were plastic but looked like metal, some had shanks and some had holes. There were even duplicates of some of them. 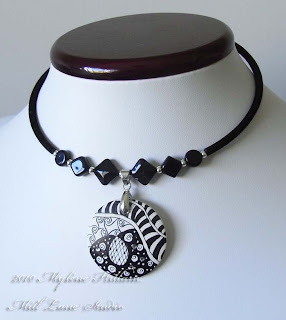 There was such a variety of colours and themes and I immediately knew that there were some jewellery pieces hiding amongst them so I set about looking to see what worked together. 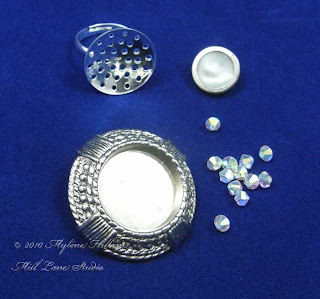 And amongst them I found a huge silver button with a deep dish ready for a jewel to be inserted, which in this case would be a pearlised button. I teamed the buttons up with some crystals to fill the gaps and a ring blank. But all I had on hand was a curved shower-disk type which wouldn't work long term but it was OK as a stand in until I got a flat one. And here's the finished knuckle duster...... You can see that I changed my mind about the pearlised button and chose a textured metal button topped with a Swarovski crystal instead. How fun is that! 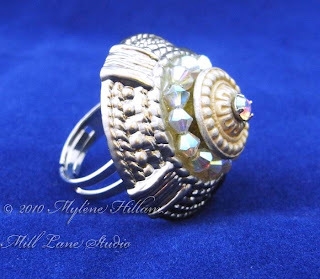 And I'm sure that if you didn't know I'd made this ring from buttons that you never would have guessed it! Now, back to rummaging through my new collection of buttons - I'm sure there are plenty more pieces of jewellery amonst them. It's Saturday.... yaaaaay! And I'm pleased to put this past week behind me. In fact, this past month and a half has been a shocker at work. It's just been one of those times when anything that could go wrong, did go wrong and anything that shouldn't have gone wrong, went wrong too. It seems like my little corner of the universe is out of kilter at present. But that usually means that it is about to turn about face and go the other way so I'm really looking forward to that happening! Good things usually result from these tumultuous events so I'm looking forward to seeing what happens next! 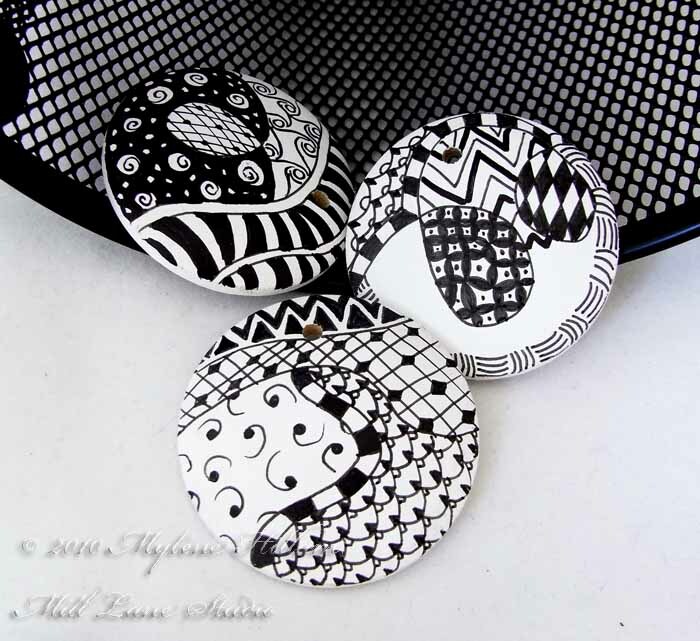 So Zentangle has been my release this week and whilst I doodled away on my stash of wooden disks earlier in the week I took to paper and card later in the week. I'm nurturing my doodling skills at the moment and trying to learn some new patterns. And as I've combined different patterns I've begun to understand things like shadow, light, negative space and positive space. Hmmph! Who would have thought you could learn so much about design from doodling?!! Anyway, I turned one of those wooden disks I doodled earlier in the week into a piece of art jewellery and added it to my Etsy shop. Stop on by and take a look. My shop is an eclectic mix of interesting pieces with price ranges to suit all. Maybe you'll find something that takes your fancy! Right now, I'm off to Australia's largest morning tea, supporting the Queensland Cancer Council. What a worthy way to spend a morning and enjoying a cuppa! Zentangle - nourishment for the brain! There is something very meditative about the art of Zentangle. I'm not much into doodling - never really have been but every time I put my pen to paper to Zentangle, I find myself totally engrossed in the repetitive nature of this art form. Maybe there is a doodler inside me after all! It is such an inexpensive and very portable hobby: I have Zentangled at the doctor's surgery, whilst waiting in the car to pick up DD from work and in planes (yippee! something to do other than watch movies and read magazines). In fact anywhere I find myself waiting for some one or some thing. All you need is a smooth white surface to work on, black permanent markers and a graphite pencil. So far, I've been skipping the pencil, preferring the cleaner, hard lines of the markers. I use Sakura's Microperm 01 for the detailed work and the IDenti Pen where I want the coverage to be heavier. I usually work on very small pieces like these disks from DIY Bangles that the patterns will fill quickly. They make a nice alternative to paper because even though they have a curved surface, the wood is so smooth that the pens just glide across the surface. But before any Zentangling can happen, you need to give the disks a coat of white paint and let them dry completely. Then you section off areas into smaller, manageable areas. And then comes the fun part: Let the doodler within you start to explore pattern! Begin with simple base patterns: dots with tails; squares; grids. Then keep building on the patterns so that they look really intricate. And that's the beauty of Zentangle: even simple shapes take on a complex look when combined with the other elements of the pattern. And what could be more striking than black on white? And even though the patterns are quite detailed, they come together very quickly because of the small surface you're working on. These disks will become jewellery pieces eventually and I can't wait to see how they turn out, but for the moment, I'm just going to let them remind me of how relaxed I was whilst I was working on them this morning. But you know, I think there may be more to it than just a sense of relaxtion: I have been thinking with such clarity all day long. Could it be that Zentangling is good for your brain?!! Perhaps every day should start with a Zentangle! 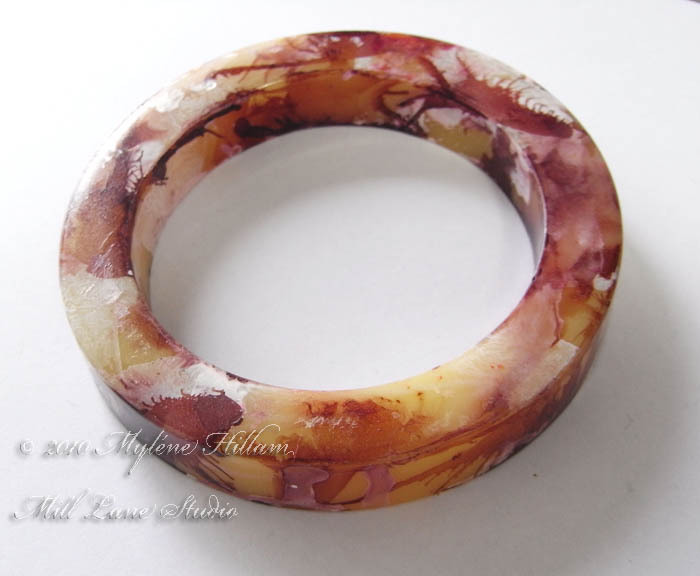 Do you love the look of resin jewellery? 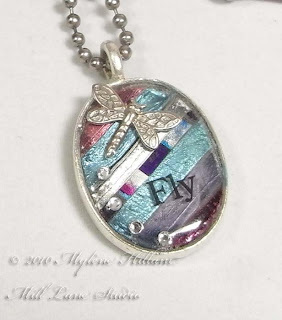 Want to make your own but intimidated by the process and not quite sure where to start? 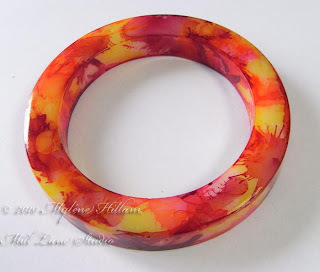 Well, why not take a resin bangle making course in Brisbane and let me demystify the process for you? I hold resin workshops in my studio each month. We cover all aspects of working with a quick curing resin: safety precautions, colourants, best pouring methods, how to avoid bubbling, final finishing - absolutely everything you need to know to create your own handmade resin bangles and rings. Your class kit contains all the materials required to make your own including detailed written instructions to refer back to, a resin jewellery book for inspiration, a Krafty Lady silicone bangle mould, enough resin to be able to continue casting at home after the workshop and pigments - essentially, everything you need to pour additional bangles at home. The next workshop is this Saturday, 15th May and it's not too late to make a last minute booking. If you're interested in spending a few hours to learn all the ins and outs of how to work with resin, check out my website for further details. Click on the "Contact me" link to book in. 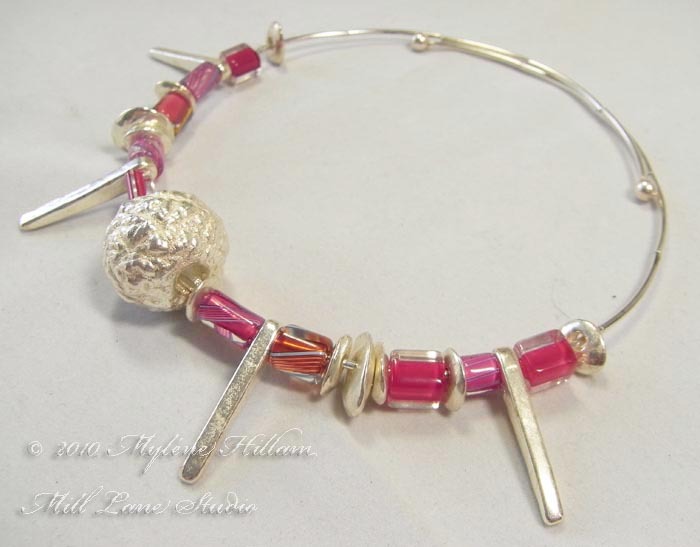 Bangle images in this post are not the style made during the workshop and are for illustration purposes only. This colouring technique is not covered in the beginners bangle workshop. 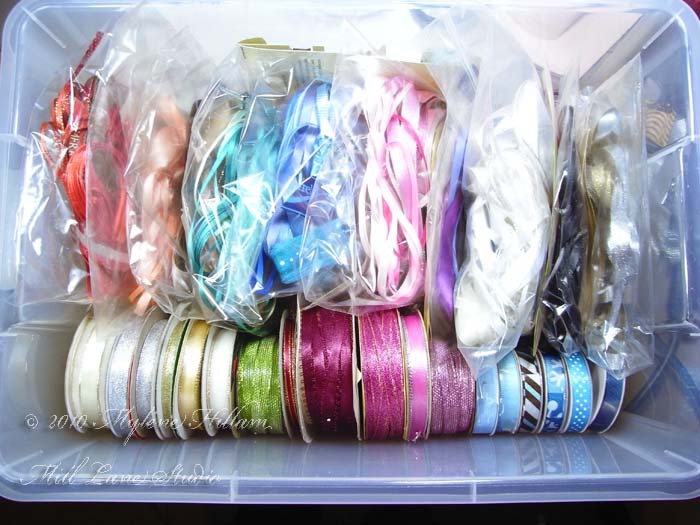 Ribbon Storage.... is there a perfect solution? Since moving into my new studio last year I've spent a fair bit of time organising and sorting my supplies. Sometimes that has meant having to re-organise and re-sort if a system proved to be unworkable. My ribbon stash falls into this category and whilst it's not that extensive, I do seem to have enough that it's a problem to store. No matter how hard I try I just don't seem to be able to keep them straight..... I always end up in one giant tangle of ribbon. Ive been avoiding this task for a while but recently my satin ribbon got into such a state that I couldn't pull the colour I wanted out of the tangle. Once I eventually managed to unravel enough of it for my project I actually had to iron the creases out of the ribbon before I could use it! This was a definite call to action. 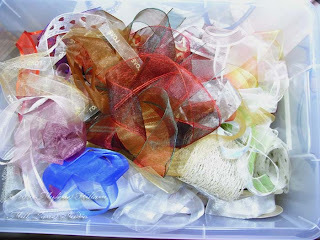 A quick Google search for ribbon storage brought up a plethora of storage solutions, some of which I've even tried in the past. Ribbon rings seemed like such a great idea but this proved to be such a hit with Kitty Kat who thought dangling ribbons were fair game. She has even laid claim to a couple which particularly took her eye! I've also tried clear jars which just look so pretty when they're filled with colour coded ribbon, but they take up way too much space. At this stage I don't have enough rolls of ribbon to warrant a haberdashery store type of solution. Most of my ribbons are in 1 or 2 metre lengths or are just mere leftovers so I decided to resort to my original storage solution: individual storage boxes for each category of ribbon I have - satin, organza and wire edged/metallic ribbons. OK, maybe that idea needed refining as they inevitably became a big tangle of ribbon again in no time at all, which is why I went searching for a new storage idea in the first place. But then it occurred to me that if they were sorted into their colours, placed in ziplock bags and then stored in the storage box that there'd be no more tangles, they'd be easy to find and they'd store really flat. Now I can easily find what I'm looking for without rummaging through a tangle. Hooray - a ribbon storage idea that actually works for me! Well at least for the time being. My guess is that this won't be the last time I seek a new storage solution for my ribbon stash (nor will it be the last time that I sort my ribbon, I'm sure!) but at present, this idea is working for me. I guess as with all storage, it needs to evolve or expand as our supplies change but I hope that this will work for some time to come. OK, that's the satin ribbon all sorted.... Time to get started on the organza! 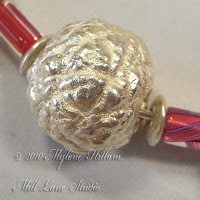 On a recent bead shopping trip I came across some bright silver, metalized ceramic beads. Like all things shiny, they immediately attracted my attention but they were rather expensive and without a clear plan in my head as to how I would use them, I passed them by. But as I wound my way through the shop, I kept finding myself back at the table these little beauties were on and I decided that that was no coincidence - a little voice inside my head was telling me that I should take them home. Luckily, I listened to that little voice and I don't regret it for one moment. There's a 3 step process to making these beads. First, the ceramic beads are fired. Then they're dipped in copper and fired again and finally the silver coating is applied. It's a long process but the resulting beads are just gorgeous! On that same shopping expedition, I found a lovely selection of glass cane beads in shades of pink, orange and red. By now an idea was starting to in my head as to how I might use these metalized ceramic beads. Such stunning beads called for something simple. 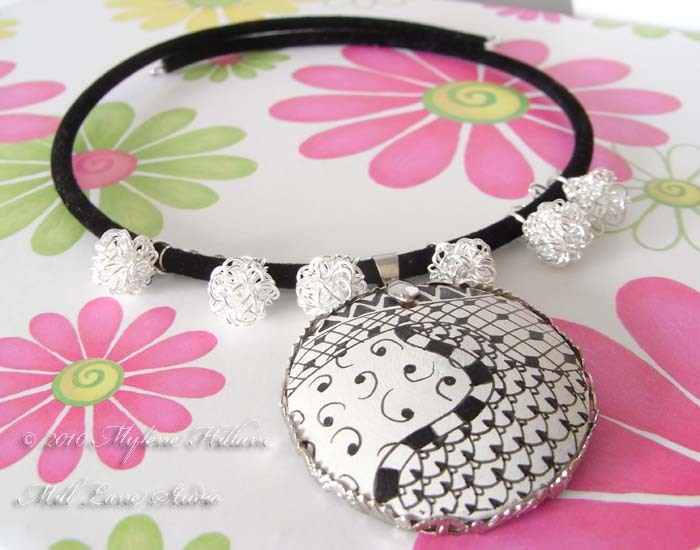 And this was it: a choker which put the metalized ceramic focal bead on show - simple but eye catching. This is another piece that is for available for purchase in my Etsy shop. I hope you'll stop on by and check out my other items.... perhaps you'll find something that takes your fancy! I'm working on some more Friendly Plastic pieces tonight which I'm looking forward to sharing with you later in the week. After many months of waiting for them to come into stock I can finally announce that I am now able to make Friendly Plastic pens in classy silver. So here's the first one, hot off the production line and just in time for Mother's Day. This one is called Silvered Rose and it coordinates perfectly with this pendant. So if you'd like to spoil your Mum for Mother's Day with a really unique gift, why not pop into my Etsy shop and make this one hers. And if this one is not quite to your liking, check out the Friendly Plastic gallery at Mill Lane Studio for a selection of other colours. Watch this space as I add more over the coming days.